I found a dog, can you take it? First off, thank you for caring and reaching out for help. The first step is to do everything to locate the owner. 1. get scanned for a microchip 2. put a large sign in your front yard saying “FOUND DOG” – many people who loose their dog will drive the neighborhood 3. get signs up in plastic protectors (opening facing down to protect from rain). 4. get the dog listed on Houston Lost and Found Facebook page and any surrounding areas’ pages 5. get the dog listed on the SPCA website, with picture 6. list the dog on Craig’s List – leave off an identifier and require proof of ownership. 7. walk the dog around, they may lead you home or a neighbor may recognize and 8. post on your neighborhood Nextdoor.com site 9. If you find the owner… UPDATE all of the pages you posted on. B. raise funds for the dog’s medical/food/boarding(if needed) etc. You can use youcaring.com / petcaring.com / gofundme.com / etc for this. C. if the dog cannot be caught, we know a few wonderful trappers that can be hired. The steps below are easy-to-follow instructions for getting a dog (or cat) the help it needs, and ultimately a forever home. Please ask if you have questions about any of the instructions. I can help guide you along the way as YOU save its life. 1. DONATIONS: Establish online donation site ( youcaring.com / petcaring.com / gofundme.com / etc). Be prepared to keep track of donations as they come in. Make sure you send “thank you” notes via email to each person. 2. PHOTO: Get one good photo to start. Put some sort of catchy text across it such as “embedded collar” or “pregnant momma” or “hit by car” to get people’s attention as they scroll through Facebook. 3. TEXT: Write a text description to post to Facebook/email to include: dog’s name, background story, where to donate online and via snail mail, and a plea for a foster home. 4. FACEBOOK: Post the photo and text on Facebook. 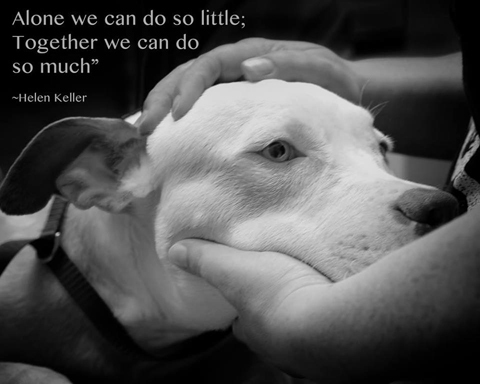 Tag every dog-friendly friend, animal rescuer, and organization you can think of in the original photo. Ensure you stay on top of all the shares people have posted as well and answer questions. You may decide to start a Facebook community page specifically for the dog (See www.facebook.com/kissalittlelongerwithbigred for an example) to build interest. 6. FOSTER HOME: Find a foster home by networking it on Facebook, Nextdoor, email, etc. Let them know there will be no cost to them. Once you have a foster, pull the dog out of boarding. If the foster needs to borrow a crate/bowls/supplies, you can borrow one on a deposit basis from Friends for Life Rescue www.nokill1.org if you ask them. Or just ask Facebook friends to borrow one. If the foster cannot afford food, FFL has a foodbank they can draw from on a temp basis. 7. RESCUE/ADOPTION ORGANIZATION: Find a rescue organization and let them know you have a willing foster already in place. Email, call, or submit online applications at each one. Be persistent and follow-up days and weeks later. Contact ALL OF THEM. Use the text and photo from Facebook, ensuring any updates are made. 8. UPDATE: Continue to update your original photos with better ones and new postings on Facebook with information about the dog’s progress and how much funds have been collected and how much you still need. 9. FUNDING: If you run short on donations, you will have to fund the boarding yourself and reimburse yourself later when donations come in. When you have enough in donations, have any medical issues treated, start HW & flea preventative, and get the dog spayed/neutered. Once you find a rescue organization, they will usually assist with medical expenses. 10. ADOPTION EVENTS: Even if you have not found a rescue organization to accept the dog into their program, you will have to set up your own adoption events around town to let the public see them. Contact small businesses such as Natural Pawz, hardware stores, Tractor Supply Company, Petsmart, PetCo, etc. and ask them if you can hold an adoption event out on their sidewalk on a Saturday afternoon. 11. FOLLOW-UP: Rescuing and rehabilitation is just the first step. You will have to continue to network the dog using social media to find it an adoptive home. You are not done until the dog has found its forever home. ***Saving a life is NEVER convenient. We get it, but it IS possible if you network the dog properly and utilize those horrible photos to enlist the help of Houston’s citizens. What ever happened to the dog hugging the stuffed animal?